Swansea is a Welsh football club that has been a member of the British Football League since 1920. In the top league they have reached position sixth as the best. They had won the Football League Cup once and the Welsh Cup on several occasions. Some prominent players through the years are Ron Burges, Terry Medwin and Cliff Jones. 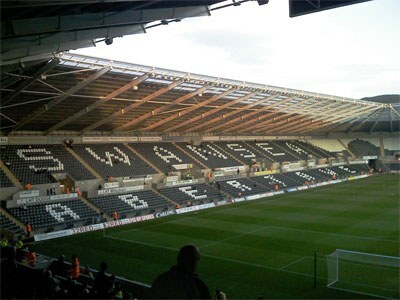 Liberty Stadium, the home Swansea since 2005. The club was founded in 1912 as Swansea Town. It would many years later, in 1970, change its name to Swansea City.